This small pilgrim badge, 33mm (1.30in) in height and 15mm (0.59in) in width, is made of lead alloy and dates to the late medieval period. It is a depiction of Saint Barbara holding a tower and a palm frond, the former representing her imprisoned life and the latter representing her status as a virgin martyr. She is a saint associated with protection against sudden death, and is considered one of the fourteen Holy Helpers. 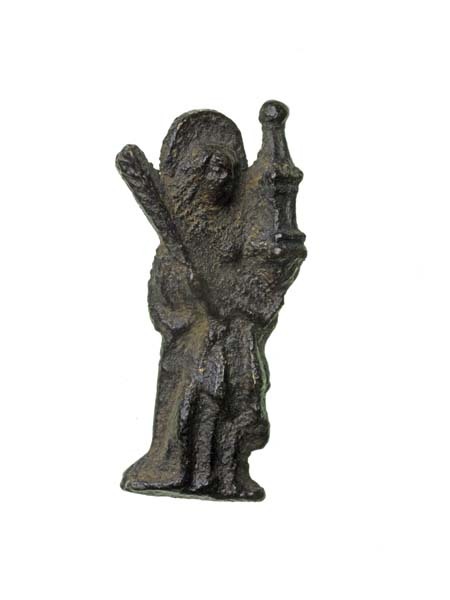 This badge may have been used as a spiritual totem used to ward off fevers and or prevent sudden death, fears which were rampant during the period of the Black Death in London. This badge has a loop on the back, which means it was most likely sewn onto its owner’s coat and worn that way. It is possible that the owner would have gazed upon the image of Saint Barbara daily, as one would do with an image of Saint Christopher, in order to be spared from sudden death. 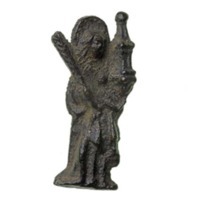 “Pilgrim Badge of Saint Barbara,” Medieval London, accessed April 22, 2019, http://medievallondon.ace.fordham.edu/items/show/80.